Come visit us for the second year at this great regional event this weekend (May 13 through 15)! This is a big event where greyhound adopters and the general public are invited to visit several wineries. Part of the activities will include wine tasting; vendors selling greyhound related items will also be on hand. 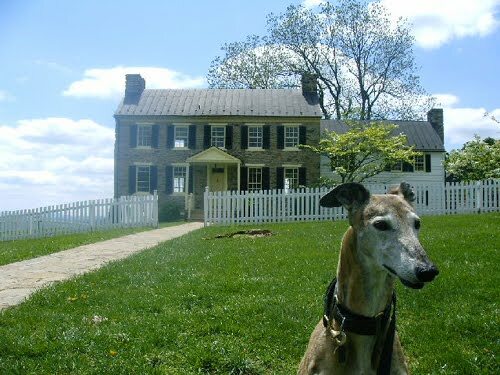 This is going to be a wonderful opportunity for greyhound owners who want to enjoy northern Virginia wineries in the spring. FFGR, Inc. is a participating sponsor and will receive part of the proceeds for our organization. Our group will also be vending to earn money to help our hounds. Particpating hotels in the area are waiving pet fees and offering group rates. Keep watching our web site and this event notice for more information! Like last year, there will be a welcome event at a Leesburg area winery on Friday evening where vendors, adoption groups and attendees will get to relax in one place and socialize with hors d’oeuvres, wine and refreshments, renewing old relationships and making new ones. Special this year is the fact that the welcome event in Leesburg will be hosted by the owners of North Gate Vineyard, Mark and Vicki Fedor. Mark and Vicki are the proud owners of their own greyhound. •food available from Uncle Moe’s Soul Food. Sunday activities will be at the spectacular Barrel Oak Winery near Delaplane, Virginia, with views of the nearby foothills of the Blue Ridge Mountains. For more information on this GREYT event, click on the title of this post. We hope to see you all there!